Modern Dispersions Inc. (MDI) has launched a new line of black masterbatches that contain 100% recycled content. The company’s ECOBlack product, made of 100% recycled carbon black from post-consumer tires and polyethylene (PE) resin from a recycled stream, reportedly sets a new standard for quality versus competitive recycle-content black masterbatches and furthermore delivers cost savings. The company will introduce the new masterbatch at the K 2016 exhibition (Hall 5/C09-4), which runs Oct. 19-26 in Düsseldorf, Germany. 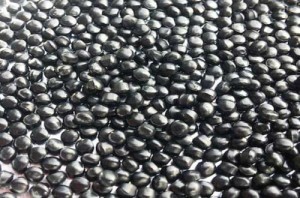 “Our new offering, ECOBlack, provides a sustainable alternative to conventional carbon black and establishes a new benchmark in terms of quality and cost,” said Jan Kozma, vice president of sales and marketing for Modern Dispersions Inc. ECOBlack 40 complements the company’s line of black masterbatch formulations. It is a PE-based masterbatch that provides the same performance as many standard grades of carbon black. From the sustainability standpoint, the use of 100% recycled content delivers major advantages. Every ton of feedstock used in the recovery process results in the elimination of one ton of oil in the production process and 1.4 tons of CO 2 emissions, according to the company. “The carbon black is recovered from tires using pyrolysis,” says Kozma. The black masterbatch offers a cost savings from 5% to 10% over standard grades and can be used in many traditional applications such as film, sheet, and molded items. The new material is used at typical masterbatch letdown ratios of between 2% and 5%. Modern Dispersions has trialed the new black masterbatch in several automotive and office furniture applications. MDI employs more than 200 people at two locations in Leominster, Mass. and Fitzgerald, Ga. At these two production sites, compounding and concentrate capacity now exceeds 200 million lb per year.